Plant a Back-to-School Vegetable Garden! - Legends Landscape Supply Inc.
It’s Labour Day; the last long weekend of the summer. You’re probably wondering what last summer gardening project you can tackle this weekend. Meanwhile the kids are probably excited about the upcoming school year and all the new classes they’ll be taking. Why not take advantage of the long weekend and the upcoming school year by planting a back-to-school garden with your children this Labour Day weekend. It won’t take much time at all. Plus, it’s a great way to ensure the whole family has access to fresh, healthy vegetables during the busy school year. This is important because it gives your kids something to look forward to as harvest time draws near. Break up the soil and turn it over while adding your fresh batch of triple mix soil. In-ground garden beds: Replace the soil that’s currently in them with your new topsoil mixture. Your kids will love doing this part. Plus, it’s real easy too. Dig troughs in your garden bed where the seeds can be planted. Then, have your children plant the seeds at the depth and spacing that’s listed on the vegetable seed packaging. Give your kids the water hose and instruct them to give your newly planted back-to-school garden a good soaking. Your kids will love doing this part. So much so, they may be reluctant to give up the garden hose! 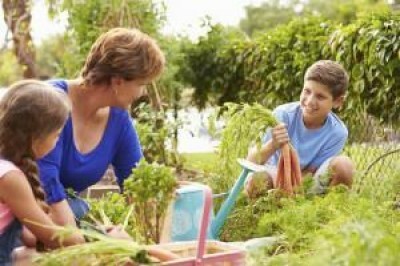 When the time comes, have your kids pick the vegetables they worked hard to grow (with some help from you, of course) and enjoy them! Your kids will really experience a sense of pride and ownership as they see the results of their efforts from start-to-finish. Plus, they’ll have healthy, delicious vegetables to eat too. Now that you know how easy it is, why not give it a shot? It’s always great to get the kids involved in gardening and planting. And now that you know how easy it is to plant a back-to-school garden, your next step should be making it happen! If you need any help along the way – whether it’s advice or gardening supplies – all you have to do is tell us what you need. Written on Thursday, September 03, 2015.